San Jose, CA – June 26, 2017 – Angie Hospitality, creator of Angie, the world’s first voice-activated hotel guest room assistant, purpose-built for hotels, announces the completion of a successful integration with Fourteen IP’s EVOLUTION Voice, a leading cloud-based PBX solution powered by BroadSoft. 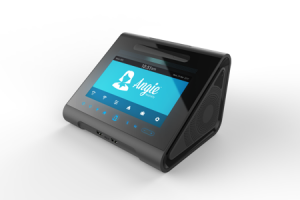 Among other functionality enhancements, this new technology integration will allow guests of hotels equipped with both Angie and the EVOLUTION Voice system to make and receive calls using voice-command through Angie’s built in telephone and integrated Bluetooth speakers. EVOLUTION Voice is designed to replace existing on-premises telephone systems or PBX with a virtual phone system that is hosted remotely in secure data centers, offering enhanced business continuity, flexibility and scalability. It offers a comprehensive feature set for both guests and staff, including call center and mobility applications and works with most existing bedroom telephones. Angie is currently being implemented at multiple hotel properties in the U.S. and will be available for general distribution in North America and Europe in Q3 2017. For more information on Angie’s full range of features, please www.angie.ai. Fourteen IP will be exhibiting their Cloud-powered PBX solution this week at HITEC 2017 in Toronto at booth # 1145. Angie Hospitality will be showcasing its award-winning voice-activated innovation at the E20X Pavilion. About Angie Hospitality | Angie Hospitality, led by industry veterans, designs and develops the only voice-activated, Wi-Fi and room control technology solution built just for hotels and resorts. Angie, the 2017 HTNG TechOvation Winner, is the world’s first cloud-managed, enterprise-class voice- and touch screen-based guestroom assistant and integrated room control device. With headquarters in Silicon Valley and London, Angie Hospitality currently offers service in North America and Europe, expanding soon to Asia Pacific and the Middle East. For more information on Angie Hospitality, please visit www.angie.ai and connect with us on our social media channels – Facebook, Instagram, Twitter and YouTube. About Fourteen IP | Fourteen IP is a leading hotel systems integrator, specializing in voice and data solutions for the global hospitality Industry. Fourteen IP offers a comprehensive portfolio of Infrastructure solutions from Cisco, HP, Aruba, Ruckus, Broadsoft and Mitel, as well as providing full fixed line and voice and data services. The Fourteen IP portfolio is delivered with customer focused services, including 24/7 customer care and engineering coverage across the UK, Europe and the Americas. For more information, please visit www.fourteenip.com.